If you are searching for a tool to securely delete sensitive data without leaving any trace, Secure Eraser is the way to go. The software is created by ASCOMP and is advertised as a Windows Backup, Cleaning and Synchronization software. The software is pretty to use and its colourful interface features only three tabs to ensure even a new user can easily understand how to use it. It comes with features, like folder deletion, registry cleaning, system cleaning, etc. making it a one-stop-solution for all your system cleaning needs. And the best part is, the system is pretty simple to use as well. While many of the reviews on the internet talk positively about the software, the fact is that is comes with a host of drawbacks and is certainly not the best cleaning tool out there. Why you need an alternative to Secure Eraser? While Secure Eraser is used by many, if you look closely, the software has a number of disadvantages. 1. Not that easy to use - While it is advertised as an easy-to-use software, it is not really very easy to use, especially for people who do not know much about computers. Moreover, the advanced features of the software will also require some time for you to understand. 2. Not for mobile phone - Secure Eraser is only for computers and laptops and not for modern smartphones. However, there are any software’s available in the market which you can use to clean your desktop computer, laptop and even your android- or iOS-based smartphone. 3. Not very quick - If you have used Secure Eraser as well as some other cleaning software’s then you will know that Secure Eraser is certainly not the quickest of cleaners. Depending on the amount of files that you are looking to delete, it can take really long time to finish the cleaning. 4. No One Touch Cleaning - The software doesn’t provide you with One-Touch cleaning feature that many other software’s provide. You need to manually select the files that you want to delete. This makes the process time-consuming. 5. Expensive - While you can download the software for free for personal use, its Professional Edition comes at 20 EUR. There are actually many other software that are cheaper and more useful. If you are looking for an ideal alternative to Secure Eraser, iMyFone Umate Pro or iMyFone Umate Pro for Mac can be an excellent choice. The software is loaded with a number of features that are sure to help you out. Let us have a look at some of them. 1. Erased data is unrecoverable - Data deleted with the help of iMyFone Umate Pro is deleted for good and there is no way to recover the data once deleted. This means that once you delete the data with the help of this software, it will not move to Recycle Bin from where anyone can recover it. The data will be permanently delete and no tool can recover it. 2. Preview and choose the exact files to delete - With the help of iMyFone Delete you can actually choose the exact file that you want to delete. Many-a-times you just want to delete a single file and not the entire folder, this is where iMyFone Umate Pro can be of great use to you. Simply choose the individual file and delete it forever. 3. Erase current as well as previously deleted files - You can not only use to iMyFone Umate Pro to delete the files that are currently on your device. You can also use it delete the files that you have directly deleted from your device in the past. While many might not know but these files stay in your device and can actually be recovered. 4. One-touch free up space - You can also use iMyFone Umate Pro’s One-Touch Free Up Space feature when the device doesn’t have space to store data anymore. So in a way, iMyFone Umate Pro is not just a cleaning software but also a space saver. Erase all data - If you are looking to sell your system or mobile phone, it is very important to first delete all your private and professional data from the device before selling it to anyone. With iMyFone Umate Pro’s Erase All Data feature you can quickly delete all the data from the device. Erase deleted files - The data that you directly delete from your mobile or computer still stays in it and can be used with the help of many tools available on the internet. But with iMyFone Umate Pro you can delete the deleted files so that they cannot be recovered with the help of any tools. 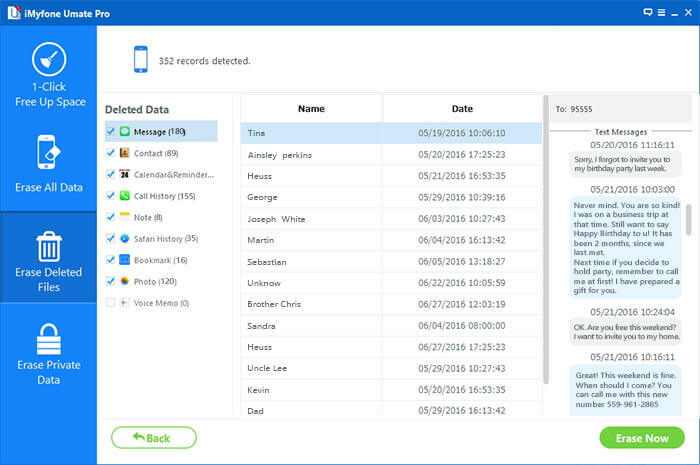 Erase private data - iMyFone Umate Pro also comes with a separate mode for deleting your private data. You can use this mode for deleting private or personal files, videos, pictures, messages and a lot more. Why choose iMyFone Umate Pro? 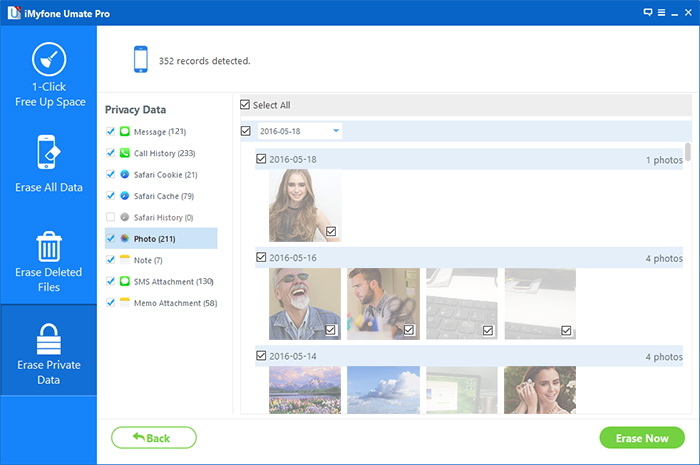 When compared with Secure Eraser, iMyFone Umate Pro has a number of advanced features that are very simple to use and make the process of deleting files from your device forever a complete breeze. Secure Eraser is not just limited in its functionality but also falls short on the number of features that it offers. If we talk about the price, the Professional Edition of Secure Eraser costs 20 EUR, whereas, iMyFone Umate Pro costs $30. While the difference is small, but iMyFone Umate Pro is cheaper and comes with many more features. With a user-friendly interface and features like One Touch Free Up Space, iMyFone Umate Pro makes the process of deleting files and making space in your device much more easier as compared to Secure Eraser. So, if you are actually looking for a iPhone data cleaning software, now you know what you should get to enjoy advanced features that are easy to use and highly effective.